The Book One is about as alluring as Ultrabooks come, pairing a stunning design with performance that will likely stack up with the leaders, like the Microsoft Surface Book. Keep your eyes on this one. Are we hurting for premium 2-in-1s? Some pairings look weird on paper, but the result winds up something that makes total sense the moment you lay eyes on it. The Porsche Design Book One is one of those results. Teamed up with Microsoft and Intel, Porsche Design – yes, the auto maker – unveiled its Book One at MWC 2017, and it boasts some distinguishing features, as you might expect it to. First off, it’s a 2-in-1 laptop that can be flipped 360-degrees into tablet mode, but said tablet portion can also be detached for portable use. For reference, the Microsoft Surface Book can only rotate 180-degrees. Speaking of Microsoft’s stunning laptop, the Book One more or less matches its Surface Book i7 pricing at $2,495 or £2,395 (about AU$3,250; release unconfirmed). 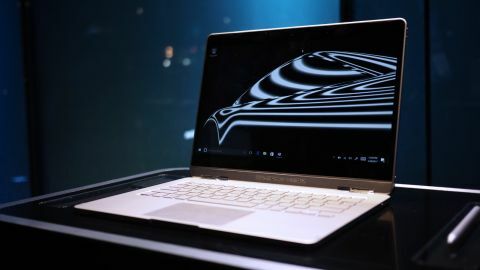 Now that it has been out for a few months, you can get some excellent deals on the Porsche Design Book One, so if you're thinking about buying this lovely designed notebook, now is an excellent time to buy. We only had a few moments with an early production model of the Book One, Porsche Design’s first-ever soup-to-nuts computer. But even so, it gives off an air of confidence in both design and general performance that the company has done this before. If the Surface Book was the reference model for Microsoft’s partners to follow, the Book One looks to be one of the few to actually challenge it. If I had to describe the design language of the Book One as simply as possible, I’d say that it’s like the Surface Book, but with some elements borrowed from the latest MacBook Pro and Google’s Chromebook Pixel alike. Coated in anodized aluminum, every bit of Porsche Design’s 13.3-inch machine feels and looks high-quality. It makes for a grand first impression, as does its 3,200 x 1,800 IPS touch display. Though the press event was dark and flashy, the Book One’s screen looked bright and bold. Running around the machine revealed a duo of USB-C ports – one just 3.1, the other Thunderbolt 3 – as well as two standard USB 3.1 ports, the latter of which being especially awesome to see here. The tablet houses the Thunderbolt 3 port, while the backlit keyboard dock is where you’ll find the rest. This space is also shared by a microSD slot. So far, so good. One feature that stood out in particular is that this laptop does away with perhaps my biggest gripe found in many 2-in-1s, the unsightly hinge that prevents the screen meeting parallel with the keyboard base. It all comes together in a form factor that’s just slightly more compact than most competitors. Though, it’s the extra mile that counts, right? As the Book One on display was an early prototype, it’s possible that my time spent using it wasn’t representative of the final product. But, in all honesty, I hope it is. Inside of the 13.3-inch tablet, Porsche Design stuffed in a 7th generation dual-core Intel i7-7500U processor that powers the visuals with its integrated Intel HD Graphics 620 graphics processing unit (GPU). Compare that to the latest Surface Book i7 in this price range and you’ll find that the Book One is only outdone in terms of graphics hardware. In addition, it also matches the Surface Book i7’s 16GB of RAM and 512GB solid state drive (SSD). We’d be remiss not to pit these two head-to-head in a full review. Running Windows 10 Pro as a touch-sensitive device, Porsche Design’s 2-in-1 is afforded all of the latest tricks, like Windows Ink. The company even built its own pen with Wacom that magnetically attaches to either side of the computer. Other signature features, like Windows Hello, are set to appear on this machine as well via a 5MP infrared webcam. As you can see, the specs and design pair up to tell a pretty convincing story, especially from a company that has never attempted such a device before. The price is quite a lot to swallow, but we’ll determine if it’s a balanced value when we test it in-depth for the full review. Porsche Design’s Book One was one of the more surprising debuts at MWC 2017, as the conference is usually reserved for the mobile industry. But in a way, it was the perfect time to show off the fruits of the collaboration between computing giants. The Book One, despite its impressive design, isn’t exactly the most novel product. Sure, it can fold more than just about every other convertible, but it’s hard to say if there’s an untapped market of people who have been holding out this long until it finally arrived.